Today, Olivia learning about fossils in her homeschool science program. 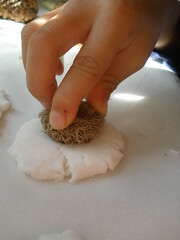 To help understand how fossils are made, Sonlight’s science curriculum had a fun hands-on activity for children to do. 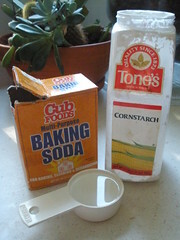 The mix is made from water, baking soda, and cornstarch. It is mixed first in the saucepan on the counter, and then it is mixed on the stove. The recipe called for it to cook for about 4 minutes or until it was the consistency of mashed potatoes. It took about half the amount of time. While the mixture was cooling, I had Sophia and Olivia go outside on a little nature walk through the backyard. They needed to return with items that had an interesting texture, and would leave a good impression in the mixture. 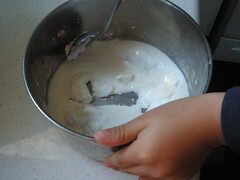 They returned and the mixture was still warm, so we did a couple other science experiments. 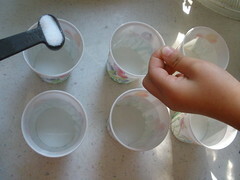 Preparing cups of water with varying amounts of salt. The girls tasted tap/well water (fresh water); water with a pinch of salt; and water with 1 teaspoon of salt (to simulate ocean water). We talked about the small percentage of fresh water in the world and how most of the water is ocean water which is undrinkable. For this reason, it is vitally important we take care of the fresh water sources we have. 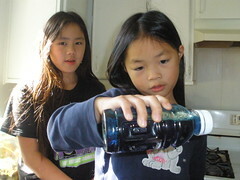 We made an ocean in a bottle using water, vegetable oil, and blue food coloring. Olivia was learning about waves and the ocean; shorelines; and how different size rocks and sand are formed due to water and waves. Back to the fossils now. When the mixture was cool, I divided it into 1″ balls. We flattened them slightly; and then Sophia and Olivia pressed different natural objects into the mixture. I let the disks dry overnight. The next day, Olivia wanted to paint them rather than leave them the natural color. So, she chose several bright colors and painted each one a different color.